“Is There a Catholic Imagination in Literature?" The novelist, critic and Emeritus Professor at Birmingham University considers this question mainly with reference to English literature of the past two centuries and the novel as a form. He has said recently: “I am no longer a practising member of the Catholic Church, but it shaped my character and writings and I continue to take a keen interest in its fortunes." In a workshop based on short writing exercises in a friendly environment, the acclaimed novelist, poet, memoirist and short-story writer will explore ideas of the numinous and the sacred: Can bodies be holy? How do we describe mystical experience? Can we write new sacred texts? Hosted by Word Factory director Cathy Galvin. Suitable for writers over the age of 18. Note: Numbers are limited to 15. The author of Skellig will use inspirational writing exercises and open discussion to help you to create your own personal mythology that supports you and in your writing. Hosted by Word Factory director Cathy Galvin. Suitable for anyone over the age of 16 who enjoys writing. Note: Numbers limited to 40. In the lead-up to the centenary of the Easter Rising in Dublin in 1916, historian and biographer Roy Foster suggests that the Irish revolution is still shaping literature and rewriting history. Four distinguished poets with differing experiences of their faith discuss how Catholicism has shaped the imagery, power and mystery in their work. Television and radio presenter Adrian Chiles invites a panel of writers to share the books and writers that have made them see the world afresh. The audience will be invited to suggest their own favourite books and writers. Poet, novelist and short story writer Jacob Ross and writer, poet and journalist Cathy Galvin look at the work of some key short story writers and read some of their own work. Three leading writers, each in one way or another a “lapsed Catholic”, discuss the enduring influence of the faith of their childhood on their work with poet and writer Cathy Galvin. Writing the sacred: scripture as inspiration? Poet and librettist Michael Symmons Roberts, American novelist Carlene Bauer and writer and Anglican theologian Paula Gooder will discuss Scripture and the Catholic imagination in literature. Meeting Room 104. £9 (concs £7). landscape, family history and stories. The historian Eamon Duffy suggests that the poetry of the Irish Nobel laureate is suffused with the imagery and sensibility of his Catholic childhood. Talk with readings of Heaney’s poetry. scriptwritter Daisy Coulam and actor Alex Macqueen discuss the surprising revival of spiritual themes in films such as Ida and Calvary. “Catholicism has been an integral part of my life, from my conversion at the age of 14, followed by a convent education. And religion has been an essential ingredient in so many of my works from Mary Queen of Scots to My History: a memoir of growing up.” Antonia Fraser talks to Mark Lawson about the part faith has played in her life. All events will take place in The Library of Birmingham and the adjacent Birmingham Rep Theatre. Events will last approximately one hour and will be followed by the opportunity to purchase books for signing by the authors. In person: Monday to Saturday 10am – 8pm or 10am – 5:30pm when there is no evening event. Prices are as stated in the programme. Concessions: £2 off ticket prices for students, under 18s, over 60, unwaged (job seekers), and disabled. Book tickets for 5 or more events and receive a 20% discount. Special rate applies on Friday 19 June: £110 double b&b and £100 single occupancy. Quote Ref: G-68TB. 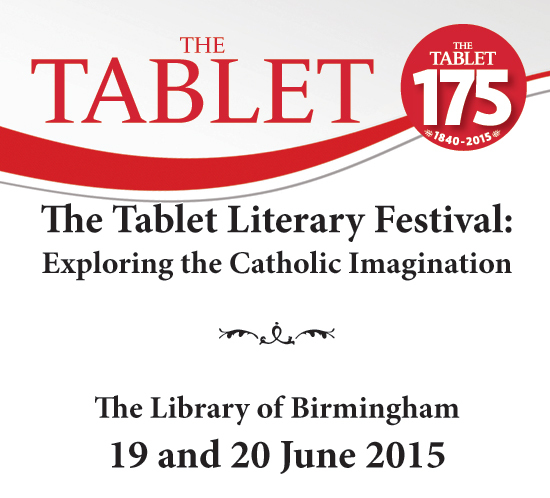 The Tablet, the international Catholic weekly newspaper.